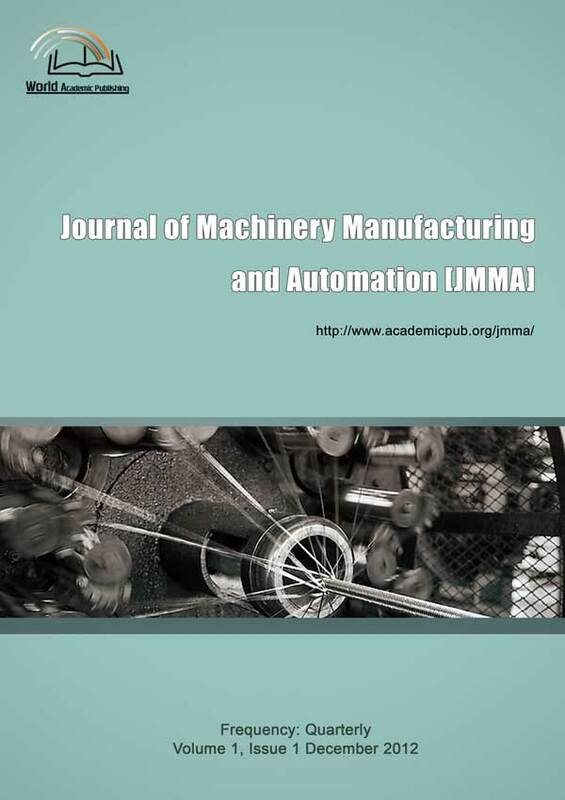 Journal of Machinery Manufacturing and Automation (JMMA) is a free access international journal, concerning about the latest research results of Machinery. The goal of the journal is to provide a global forum for scholars, researchers and managers in the field of mechanical engineering and inter-discipline to exchange ideas and promote the application and development of mechanical technology. Papers to be submitted to JMMA are required to be typewritten in English, using the WORD or PDF template. All articles should contain the article title, all of the authors' names and full affiliations, abstract and keywords. Accepted papers will immediately appear online followed by printed hard copies by WORLD ACADEMIC PUBLISHING CO., LIMITED globally. Therefore, the contributions should not be related to secret. The author takes sole responsibility for his views. Abstract:This paper presents a method for finding the most-squares solution for separating cars, and intends to develop technologies to be able to separate cars from compact and standards based on images taken from the camera. Two major methods are used basically: 1. convex hulls algorithms to obtain car’s convex hull region and 2. classifying by separating cars into clusters regarding area and circumference of the regions obtained from car’s convex hull. Finally, a numerical example is presented. Abstract:The importance of intermittent motion in many equipment and machinery has called for the necessity to fully understand the various concepts of those systems where this type of motions are required in between continuous motions and also in those systems designed to perform automatic timing operations in robotic applications. This paper examines the kinematics analysis of a four (4) slot Geneva mechanism. The arbitrary model was developed and the effects of the force were neglected. The angular displacement of the wheel was investigated as is the function of crank angle and found to occur between ±π/4; 7π/4 to 9π/4; 15π/4 to 17π/4; 23π/4 to 25π/4 radians for the 1st, 2nd, 3rd and 4th revolutions of the crank angle respectively, in between these angles, there are dwelling periods. Also, for an assumed speed of the crank (12 rpm), the angular velocity of the wheel was obtained to be maximum and minimum between ± 3.0338 rad/sec at crank angles of 0°,2π,4π and 6π radians, for each of the 4 revolutions and that of angular acceleration was ±8.5161 rad/〖sec〗^2 at ±0.19,6.10 and 6.47,12.38 and 12.75,18.66 and 19.04 radians respectively. The timing of the tangent drive was expressed by the arc of each revolution of the driver or crank that the wheel was being indexed and the arc of each revolution that the wheel was at rest (idle).